Imagine forcing a segment of the population to register with the government based solely on their personal beliefs – all because some could be terrorists. This unbelievable scenario happened in the Marvel Universe, but do you know the real story of Civil War? The first hints of registration came in from the alternate reality of Days of Future Past (Earth-811) where the Mutant Control Act was created in 1984 after the assassination of mutant-control proponent Sen. Robert Kelly was assassinated by a mutant. This led to a military takeover with Sentinels wiping out all opposition and rounding up mutants. Although this future was averted, the creation of an act controlling the activities of powered people was only delayed. In another alternate reality story (guided largely by Alan Moore), British Parliament member “Mad” Jim Jaspers passed anti-superhero legislation on the “Twisted World” (Earth-238), and created the nigh unbeatable Fury android to kill all of Earth’s superheroes. With the superhumans taken out, Jaspers revealed himself as a reality-altering mutant, but his world was wiped out to prevent Jaspers’ madness from spreading. Unfortunately, the Jaspers of the Marvel Universe (Earth-616) tried to pass similar legislation; fortunately, the Fury escaped the destruction of Earth-238 and was pitted against the Jaspers of Earth-616, and the two consumed each other, averting the crisis. Again though, this only delayed registration act creation. 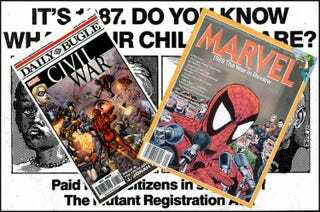 Registration was finally ratified in the main Marvel Universe (again, Earth-616), with Senate Bill 1, the Mutant Affairs Control Act, which led to the Mutant Registration Act. Initiated by Senator Kelly, the act allowed government agents like Freedom Force (made up of former Brotherhood of Evil Mutants Members) to arrest and detain any unregistered mutants. This came to a head when the X-Men were in the government’s sights – they escaped while faking their own deaths in The Fall of the Mutants. In his remarks, the Captain spoke of the legacy in this country of individual freedoms: Freedoms, he said, whose very existence he has guarded and championed throughout his long career, freedoms he felt would be jeopardized by the proposed law. While Mr. Stark agreed in the main with Captain America, he felt that some sort of regulation of superhuman activity might be useful, if only because of the ever-growing number of people engaged in the practice. The act didn’t pass, but the seeds of Civil War had been sown. Not long afterwards, Canadian politician Robert Hagon pushed forward the Paranormal Registration Act which enabled Canadian authorities and private security companies to hunt down “unregistered paranormals.” The act was later revealed as a plot by the immortal known as “the Master of the World,” and eventually deemed unconstitutional by the Canadian Supreme Court, causing the legislation to become extremely watered down (this according to the Civil Wars Files one-shot). Here’s where it gets tricky. Unbeknownst to Captain America and 99% of the world’s super population, Iron Man had been meeting with the Illuminati, a group of the world’s most influential heroes, secretly shaping world events. Black Panther had been invited, but declined involvement. In one meeting, Iron Man revealed congress was planning to push a new Superhero Registration Act (SHRA) 6 U.S.C. § 558. He suggested the other heroes convince their respective teams to fall in line to prevent any violent resistance. When they questioned this wisdom, he explained that as a “futurist,” he knew some major event would be televised that would cause public backlash and force a conflict between superhumans. A few weeks later, the exact thing he predicted happened as the New Warriors reality TV show got involved with a conflict with the hero-killer Nitro. The resulting explosion killed hundreds of civilians in Stamford, Connecticut, including several children. The SHRA passed immediately, and one of its first major opponents was Captain America, who (despite being registered himself) became a national fugitive when he protected unregistered heroes from the “Cape-Killer” agents working for the Presidential Super Hero Task Force under Acting Chairman Tony Stark. Seems like everything Stark said came true, right? But there’s a hitch in that – just before the Stamford incident, Tony Stark was speaking to the Senate Metahuman Investigations Committee, with his then-employee Peter Parker in attendance. As if to prove everything Stark was warning about was true, old Iron Man villain Titanium Man showed up and wreaked havoc throughout Washington DC until Spider-Man stopped him. Afterwards (in Amazing Spider-Man #531) the Committee acted favorably towards Stark’s suggestions, and Peter, a bit suspicious, asked Stark straightforwardly if he have anything to do with Titanium Man’s appearance. Stark denied it. That night,Iron Man paid Titanium Man for his participation. Also, in Wolverine Vol. 3 #43, Logan tracks down Nitro following the Stamford incident against Tony Stark’s explicit orders to leave Nitro alone. Like Captain America, who was registered by the mere fact that he worked for the government, Wolverine was registered as one of the 198 known mutants in the United States at the time, so Wolverine didn’t have to get involved. He wanted to. In the hunt for Nitro, it was revealed the villain had been supplied with drugs that enhanced his already impressive explosive abilities, a safe house to hide in after the Stamford incident, and some protection from law enforcement (as long as he didn’t get himself caught by people not following orders, like Wolverine). This was never traced directly to Stark, but as the people hiring Nitro were using Stark technology, it was heavily implied. So it looks like Tony Stark was not only on the side of the SHRA during Civil War, he may have orchestrated everything, including deaths of hundreds of innocent people. Damn. But it gets worse. During the subsequent eponymous “war,” Tony and fellow Illuminati member Reed Richards build a cyborg clone of Thor (who later calls himself “Ragnarok“) to help them fight Anti-Registration forces, and the clone kills Bill Foster, AKA the hero Goliath. Again, damn. And it gets even worse. Using Richards’ Negative Zone portal, the Pro-Registration forces build Prison 42 inside the Negative Zone expressly for the indefinite detention of superheroes and villains who refuse to register. To be clear, this is a federal facility deep inside hostile territory that is housing detainees accused of possible connections to terrorism (*cough*Guantanamo*cough*). Yet again, damn. Oh, and recall how Black Panther wanted nothing to do with Tony Stark’s Illuminati? He knew something like this would happen as these already powerful individuals convince themselves they would know what was best for everyone else. While the US was enacting the SHRA, other world nations began working on similar legislation. The Pan-African Congress on the Treatment of Superhumans was convened to discuss the continent’s potential reaction, and Black Panther officially declared his neutral status, refusing to get involved with the war (while secretly aiding some Anti-Registration forces). But in his report to his superiors, including the president (Civil War Files), Tony Stark stated, “Wakanda has not responded well to our subtle threats of force, such as deploying the U.S. Marines to the Wakandan-Nigandan border to practice war games and sending a U.S. warship to the Indian Ocean in striking distance of Wakanda.” So Stark was fully aware, if not involved with the antagonization of Black Panther’s kingdom. Sure, he recommended military forces back off afterwards, but still – daaaamn. For the record, several other countries got involved with their own versions of the SHRA, with Canada strengthening its previously weakened act, and Britain finally following through with what Jaspers had started, but pushing forward Superhuman Registration Act No. 1521 (C. 69), partially overseen by Bobbi “Mockingbird” Morse’s sometime boyfriend Commodore Lance Hunter of the Armed Forces Paranormal Response. All of this sets up Tony Stark to look like the bad guy in this scenario, and Steve Rogers, who was opposed from the very beginning, to look like the hero – but that wasn’t how the ordinary people saw it. See, for all of the cloak-and-dagger work on Stark’s behalf, and all of the holier-than-thou grandstanding of Captain America, Tony Stark was right. In the real world, locking up an entire group of people, or forcing them to register with the government, simply because of their beliefs or ethnic status, is wrong, but in the real world, people who take the law into their own hands or who have the ability to blow up entire city blocks aren’t given keys to the city or lauded as heroes to all mankind. In the world of the Marvel Universe, superhumans are a very real threat. Anyone could be a mutant, Inhuman, Synthezoid, or alien and have the power of an atomic bomb (or worse) inside them. And even those without powers, like the Punisher or Amadeus Cho, could potentially bring down entire countries all by themselves and never face any real consequences. And even ignoring the plight of average humans, what about the heroes themselves? Just before the SHRA debacle, Daredevil’s secret identity was revealed to the press. His life was ruined. If he had been registered with the government, his identity would have been a national security secret, and anyone who leaked it would face the same penalties as someone leaking the identities of undercover agents. Spider-Man revealed his identity to the world in support of the SHRA, then switched sides, forfeiting all government protection. Almost immediately, his family was put in danger and Aunt May was assassinated (leading to a strange story that is better not mentioned here). And what about making superhumans into law enforcement and military agents? That means average citizens could now seek legal restitution whenever a super-battle destroys their home. Before, if Hulk crashed through your wall while fighting the Abomination, you would have to argue with insurance adjustors to get any kind of claim covered or hope a supervillain would be nice enough to pay for it, but now, you could sue the government as one of their agents would be responsible for the damage. And what’s more, Stark had promised the mother of one of the children killed in Stamford that citizen victims would be cared for from now on, so it’s reasonable to assume government aid and/or grants from the Maria Stark Foundation could help people put out of house and home by superhero battles. Not to mention the second chances various superhumans would get. Under the height of the SHRA, anyone who worked with the 50-State Initiative (originally the Avengers Initiative), could receive a full pardon for past crimes, training on how to responsibly use their powers, and a position on one of the 50 new teams being placed in each US state with gainful employment, health coverage, and retirement benefits. Why rob banks when you can beat people up on Uncle Sam’s dime? The SHRA did, eventually, go bad. Following Stark’s failure to detect and prevent the Secret Invasion by the alien Skrulls, he was removed from office and replaced by Norman Osborn (of all people). Osborn then tried to use the SHRA resources to target heroes he had grudges against, then after an unwise battle with Asgard, he was removed from office, revealed as the Green Goblin (again), and the SHRA was either removed or heavily scaled back. Without any real way to safely close Prison 42 without accidentally releasing tons of actual supervillains with hundreds of otherwise well-meaning superheroes, Prison 42 remained open but was ultimately attacked by denizens of the Negative Zone (who usually hate all Earthlings). After the prison escape, US authorities apparently washed their hands of the whole thing, and the issue was not revisited. Oh, and after Steve Rogers realized he was in the wrong in Civil War, he surrendered. Then he was assassinated and Winter Soldier became the new Captain America. Then Steve got better. Originally posted at Kevin Garcia’s site, Monomythic.com, on Nov. 29th, 2015.